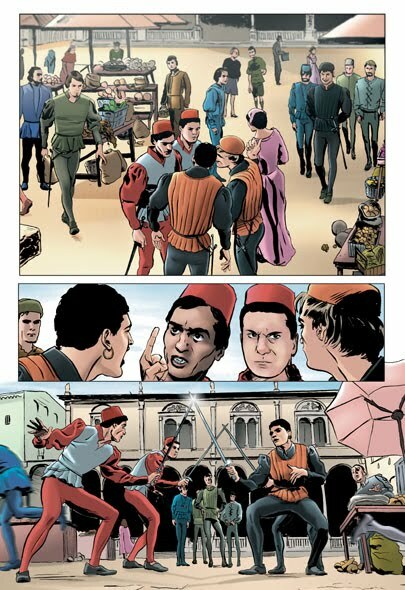 Romeo and Juliet – the graphic novel? In January I proclaimed that I was going to join Graphic Novel Challenge I bet you all thought that I had forgotten didn’t you? 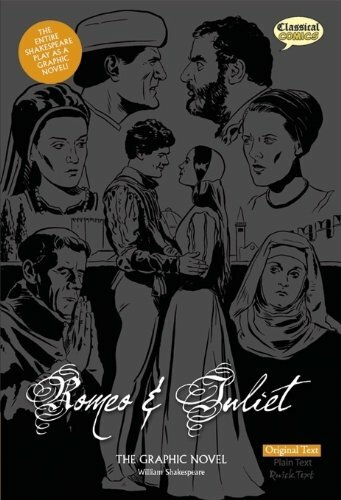 Well, here is the first one for review Romeo and Juliet The Graphic Novel: Original Text. Having not been a regular graphic novel reader I was a bit hesitant about how I would feel when reading this novel. It seemed a bit silly at first to read a graphic novel adaption of a play written specifically to be performed aloud. Shakespeare’s language is meant to be heard, so how could they condense the language into small blurbs in bubbles over characters heads? Of course, in the novels favor, all the scene descriptions, time place, weather, etc… can all be found in the language so that all was able to be cut without sacrificing any of the plot or dialogue between characters. The look of the novel is very traditional, and mirrors what most people would expect, especially if you have seen the Franco Zefferelli’s 1968 film. Nothing in the adaption seems out of place for the story it is telling. But what scenes are chosen to be illustrated and how is a very interesting choice. Much like a director, the illustrators had to chose what they felt was most important to show and how to show it to the audience. What scene can be told on one page with six panels, or three pages and 30 panels are all things that had to be broken down in a way that makes the story make the most sense. For the most part I think they got it right, The flight scenes are drawn with a sense of power and movement, so that the reader was invested in the fight, both thematically as it relates to the story and physically as something to see. The balcony scene has the romantic overtones (and Romeo on the balcony with Juliet as opposed to one the ground as Shakespeare intended) and the physicality of watching someone climb said balcony. As a late to the game graphic novel reader I sometimes had problems following the order of the pictures and which way and when to read the wording (or maybe that’s not a normal thing and that’s just me?). Once I got into the flow of the story and the language (it helped that I have this play memorized, yes?) I liked the choices made to help with the telling of this story. At times there are things that seem almost overly spelled out, as the line and the action by the character are the same, but then I realize that in some ways this makes the action more clear than just by having them say it. On stage the line “I bite my thumb at them” can be lost, biting one’s own thumb can be too small a movement for people in the back row tosee. Some people may not realize this is an insult. The comic book somehow makes it quite clear through three panels. I would fight this guy if he did that to me! Sometimes I had issues with a few of the drawings (sometimes there was a heavy black line on Juliet’s face that made her jaw look more mannish than a 14 year old girls ever should) but mostly the illustrators did a very good job recreating the scenes of Romeo and Juliet’s world. I am a fan of anything that brings theater and playwrights, especially Shakespeare, into a sphere that makes it easier for anyone (these novels aren’t just for kids) to read, understand and enjoy. I think this graphic novel adaption is an excellent way to introduce literature and theatre into someone’s life. This is an especially good way to introduce plays, most of which are meant to be heard and seen. At least in this format you can see it and read it, or you can even read it aloud. Definitely pick this up, it is very entertaining and true to the play from which it comes. Now I am interested in the post apocalyptic, Romeo falls into a vat of nuclear waste and gains powers while Juliet has a secret identity graphic novel version. Anyone know where I can find that? Previous Post Best comment EVER!!!! Next Post Genetics and fractions can be so confusing..